When it comes to a baby’s first mattress, you cannot be too careful. 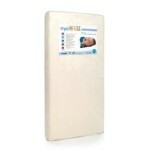 The mattress you choose should be baby safe and comfortable. The Simmons Kids Beautyrest crib mattress is one that many people love putting into their infant’s crib, but is it the right choice for you? 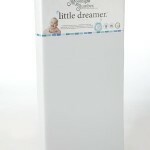 The Simmons Kids Beautyrest Beginnings Sleepy Whispers is a 2-n-1 crib and toddler bed mattress. This means you will be making a one-time investment into your little one’s mattress. It will fit both the cribs and all standard toddler beds, no matter which type of bed you choose to put them into as they grow. As a newborn you will want to use the firmer side. When your child reaches toddlerhood, you can flip the mattress and find a softer convoluted layer for your growing child. However, if you are still uncertain which side to use for your infant or toddler, there is a label on each side to tell you the ideal side for your little one. It is made with 231 luxury pocketed coil springs to give your child, even support throughout the first few years of their life. Around the edges you will also notice a reinforced border and Innofoam corner protectors to protect your child while they sleep, even when they begin to roll around the crib. 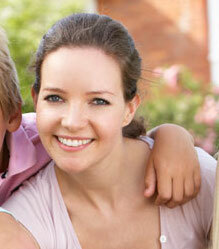 These features also provide stability for the crib mattress. 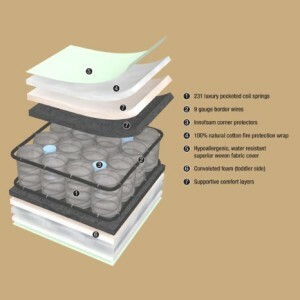 This mattress is naturally protected against fire and meets or exceeds all federal flammability standards, while remaining free of chemicals. Along with the fire protection wrap, you will also enjoy that it has a woven fabric cover that features a medical grade waterproof barrier. The waterproof barrier is also stain resistant. When you purchase a Simmons Kids Beautyrest Beginnings Sleepy Whispers mattress, you will get a limited lifetime warranty to ensure your investment. 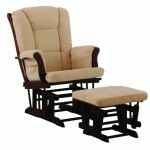 It is also lightweight, at 26 pounds, made in the USA, and holds the GREENGUARD GOLD & CertiPUR-US seal of approval. This means that it will create a healthier indoor environment for your little one to rest, so that you can sleep easy as well. This mattress measures at 27.5x6x52 inches. This is the standard width and length for most cribs. It means that it will sit in the crib snugly to help ensure that your infant does not roll off and get stuck between the crib slats. This mattress is ideal for even the smallest infant and you will never have to worry about your child rolling off the mattress and getting trapped. The fact that it fits so snugly may make it hard to make up the bed, but it ensures that even the baby who is actively pulling themselves up, will be safe. It meets all safety regulations to protect your baby and toddler from all types of danger. It is water resistant so you do not have to worry about cleaning the mattress after an accident and it is fire resistant to ensure your little one is safe during even the absolute worst case scenarios. 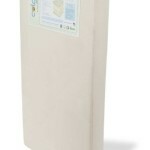 Both infants and toddlers sleep well on this Simmons crib mattress, even if there are some parents who feel that it is too firm. 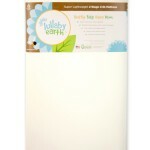 The firmness is great for helping parents feel comfortable knowing that their infant is sleeping peacefully. 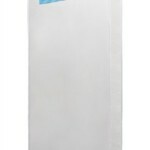 The fact that this mattress is fabric covered, your little one will be able to stay cool while they sleep. Some people feel better about adding a plastic cover, but it is not required. 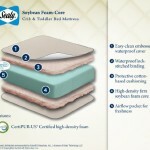 If you are concerned about whether the mattress will fit inside of your crib, there are a few options. You can purchase a Simmons crib for about the same price you would pay for other cribs and it will be a guaranteed great fit. Some people have noticed black/brown spots on the mattress. 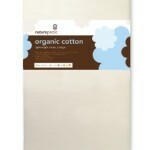 This is natural cotton fibers that are just a part of the mattress. For the people who noticed it, their first thought was that it was possibly mold. You do not have to worry if you notice this issue. Most parents do not see it at all. 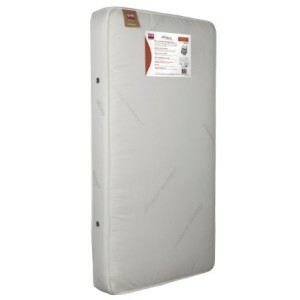 When this mattress is shipped, you may end up receiving a mattress that has lost its plastic wrapping. The wrap is purely for shipping. The mattress is fabric covered. However, the fact that it does lose the plastic wrapping means that it will not smell when you take it out of the box. Some who have received a fully intact plastic bag over their mattress say that it may hold odor for a day or two. Is It Worth Paying a Little More for the Beautyrest?